Many of you probably read the post recapping the crazy day of candidates being endorsed by CRA. Before Chris Nguyen and I left we grabbed as many different pieces of candidate literature as possible, although some pieces were definitely gone. 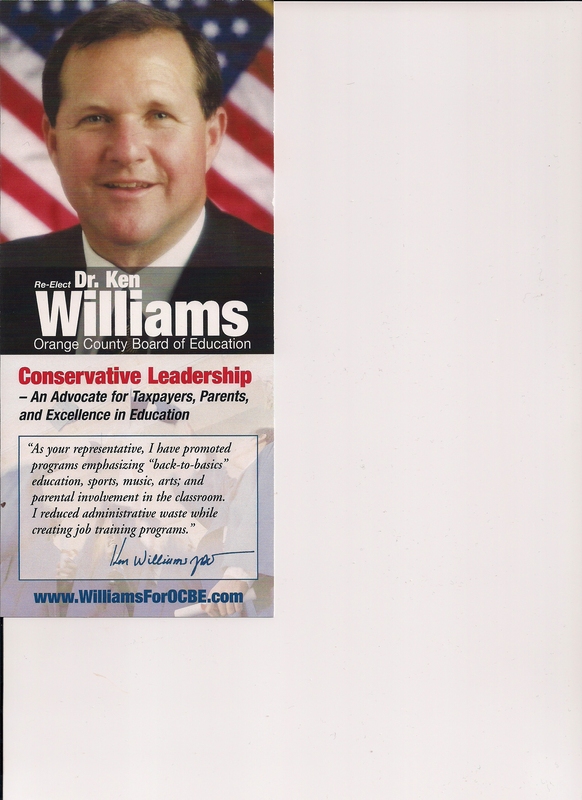 This week I will be posting a different piece each day starting with Ken Williams , candidate for Orange County Board of Education-District 3. In order to provide full disclosure, Ken Williams is a Custom Campaigns client. This entry was posted on March 26, 2012 at 8:52 PM	and is filed under Orange County Board of Education. Tagged: Ken Williams. You can follow any responses to this entry through the RSS 2.0 feed. You can leave a response, or trackback from your own site.